Make great decorations using trash bags! Turn everyday trash bags into a giant frightening arachnid! If using wire for bendable legs lay wire on top of bags and cut to the same size. Roll up tight lengthwise and tape at ends and at the area the bags overlap. Make additional synch points along the leg to emulate a spider’s leg joints and to keep the bags rolled snug. Cut four small slits along one side of the spider body, low and close to the ground. Do the same on the other side matching the approximate slit positions. Thread the legs in one of the slits, weave through the stuffed bags, and pull out the slit on the opposite side. Bend all the legs UP at the body and bend down to replicate a spider legs. Cut 3 red plastic party cups approximately 3” from the bottom. Place him in your house or right in the front yard to greet trick-or-treaters! Two white trash bags and leftover plastic grocery bags are all you need! 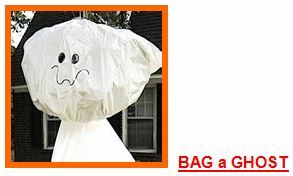 Hang Bag a Ghost in tree, ledge or awning and watch as he sways in the breeze! More Bunny For Your Money!